The photos from the day are all available on our facebook page, remember that you do not need to be a member of facebook to view or download them! 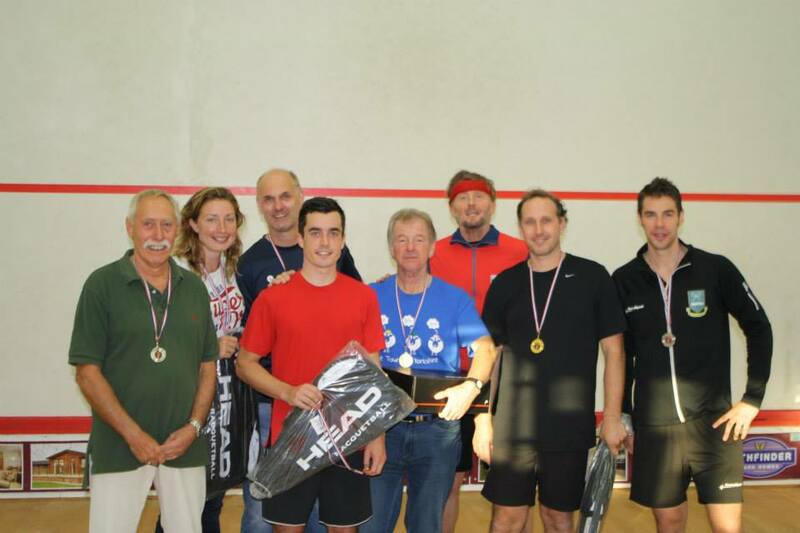 The Devon and Exeter Racketball Open returned for its third year running on Saturday with over 50 competitors participating. The A grade saw one of the strongest UK-Racketball events that we’ve seen. Ex Professional squash player James Snell came through on top of his group without dropping a game. Luke Bishop, number one seed, had a tricky start in his match against James Snell and was unable to recover despite some flamboyant shots! In group B, Mark Fuller was pushed hard by both Michael Gregory and Peter Joyce, but still came out top of the group going into the final. In the final James Snell proved too strong and consistent for Fuller taking the title 2 – 0, winning his first UK-Racketball series title. This was the largest group on the day with 10 competitors overall split into two equal groups of 5. Group A saw Alex Glencross, of Hallamshire, come through on top without dropping a single game, with Josh Park coming in second. There was a close battle for third place between Lee Sadler and Elliot Haines, with just one game between them. In Group B series favourite Michael Keogh battled hard all day but was unable to make it through the group. However, local girl Natalie Lawrence came through as group winner, after only dropping one game to all day to Rhys Greenaway in the groups deciding match. Rhys Greenaway and Mark Banfield drew on equal points as group runner ups. In the final, Alex Glencross defeated Natalie Lawrence 2 – 0 to take his first B grade title. The Women’s event was dominated by the young girls who had travelled down from Hallamshire, but in the end it was the local girl from Devon who came through to win group A without dropping a game. She was closely followed by Holly Moore who overcame Grace Spink and Chloe Widdowson, beating them both 2 – 1. In group B Lucy Ward came through as the group winner defeating both Isabel Chalmers and Caroline Wright. In the final Natalie Lawrence’s fast movement and powerful shots proved a bit too much for Lucy Ward, as she came out on top 2 – 0 adding another UK Racketball title to her collection. Group A top seed Peter Marsden came through as the eventual winner, with 6 points. In group B Paul Johnson overcame the ex UK Racketball winner Rob Watkins 2 -0 in the deciding group match to go through. In the end it was Paul Johnson who overpowered Peter Marsden to take the title with a 2 – 0 victory. It was another good, competitive entry into the over 50s, with Nigel Bell winning group A despite being pushed hard by both Martin Nash and Mark Banfield. The battle for second place couldn’t have been any tighter with Martin Nash just beating Mark to the 2nd spot in the group. Group B was equally close with only one point separating Chris Davey and Lee Sadler, but it was Sadler who finally went through as the winner. The final saw yet another close match between Nigel Bell and Chris Davey, with Nigel taking the match 2-1 to win the title. There was another good entry in the over 60s event with Graham Greensall the number one seed who’s already won a title this year, being defeated for the first time ever by David Mudge in group A, who went on to win the group despite being taken all the way by Max Newberry. In the five player group B, it was Andy Mitchell who managed to come through without dropping a game, group runner up was Philip Clarke. Despite playing more games than almost anyone on the day, Andy Mitchell defeated local man David Mudge 2-0 in the final. It was another great day at Devon and Exeter, the club is one of the best Racketball clubs in the country where we are always made to feel really welcome. A massive thank you to everyone who worked hard from the club to make it possible, hopefully next year we will return for another successful tournament! Click below for the entry list for the Devon and Exeter. All the rankings are taken from the September rankings! The Devon and Exeter club is one of the best supporters of racketball in the county; with a fantastic local following, it is a beacon for the sport in the South West. With the help of ESR South West regional manager Matt Baker, racketball has really kicked off at this club. In fact, so much so that one of their courts recently converted to a gym has been reconverted back to a squash court, such is the demand for racketball.